Baskara T. Wardaya SJ is a historian and an ordained Jesuit priest. He is the director of PUSDEMA (Centre for Democracy and Human Rights Studies), Sanata Dharma University, Yogyakarta, Indonesia. He teaches History, Religion and Politics, and Development of Cultural Studies at the same university. 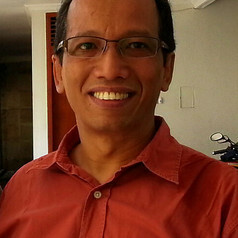 He is currently the head of the Jesuit Refugee Service Indonesia foundation. Baskara received his doctoral degree in history from Marquette University, Milwaukee, Wisconsin, USA. In 2004-2005, he was granted a Fulbright scholarship to do post-doctoral research in History in the US. In 2011-12 he was granted another Fulbright scholarship to teach history at the University of California-Riverside. In 2014 he conducted archival research on US-Indonesian relations during President Nixon's administration (1969-74) in the US with the generous grant from AIFIS (American Institute for Indonesian Studies).